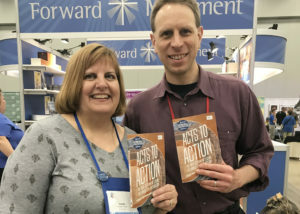 Susan Brown Snook and Adam Trambley are the editors of Acts to Action, a Forward Movement publication focusing on Acts Chapter 8 and evangelism in a changing world. Susan serves as canon to the ordinary for church growth and development in the Episcopal Diocese of Oklahoma and Adam is the rector of St. John’s Episcopal Church in Sharon, Pennsylvania. Contributors include Joseph Alsay, Carrie Boren Headington, Frank Logue, Brendan O’Sullivan-Hale, Steve Pankey, and Holli Powell, and is framed by reflections from church leaders Jennifer Baskerville-Burrows and Gay Clark Jennings. How did the idea for this book develop? Susan: Adam and I, and a number of the authors in the book, have been inspired by the 8th chapter of Acts for quite a while. In fact, we are leaders in a group called the Acts 8 Movement, which is dedicated to mission, prayer, and evangelism in the Episcopal Church. We want to help our church proclaim the gospel in creative, courageous, innovative ways to people who have never heard it in any effective way. As we considered ways to help the church think through innovative ways of proclaiming the gospel in a time when many people have no connection to church or Christian faith at all, we realized that Acts Chapter 8 had some compelling things to say about church mission. The four stories contained within this chapter show the apostles struggling with many of the same issues our church struggles with today. So we gathered a group of people to help us explore those issues for the twenty-first century. How do you see the book being used? Adam: Acts to Action is designed to be read both by individuals and by groups, including church leadership groups. Each chapter has two sets of questions. The first are for reflection and discussion, and the second are for action. The action steps are small, concrete ways that implement the Scriptural insights. My hope is that people will read each chapter, spend some time reflecting on it by themselves or in a group, and then take the action steps. These steps can help people and churches live into Acts 8-style evangelism that should bear good fruit. Susan: We hope that vestries, small groups, and individual Christians across the church read the book, discuss the discussion questions, and find inspiration for their own ministries. So many churches are working to discover how God is calling them to change, grow, and reach new people in a new era. We hope this book provides ideas and insights that spark new approaches to Christ’s mission in the church. What inspires you most about Acts Chapter 8? Adam: The most inspiring piece of Acts Chapter 8 is the assurance that God is bringing new life out of even the most difficult situations. Even if everything seems like an unmitigated disaster to me, I can be assured that God is weaving everything together in amazing ways. God’s imagination is far beyond my own…who knows what beauty God is unfolding? Susan: Christians in Acts Chapter 8 find themselves in a world where everything has changed and they need to find new ways of practicing their faith – and they go out into the world and proclaim the good news of Jesus. We believe that the Episcopal Church is in a similar situation….For churches to proclaim the gospel in today’s world, we need to find active ways of proclaiming the gospel, going out into our communities and our world and talking to people about Jesus, rather than waiting for the people to come to us. We used Acts 8 as our inspiration in this book, because it leads to many insights about church mission in a time when the church needs to change the way it approaches its mission. Do you have any stories that you feel deeply embody Acts Chapter 8? Adam: My current congregation is having an important Acts 8 Moment right now. Over the past year, we have lost about a third of our choir due to graduations, deaths, and job relocations. Instead of limiting ourselves to pleas for more singers in the parish newsletter, we really thought about how we could use this need for more choir voices as an opportunity to reach people beyond our walls. After a number of discussions with people in the community, we are piloting a musical scholars program this year. We have nine high school students who will be receiving scholarships to attend choir rehearsals, sing in worship, and participate in an hour of Christian education and formation each week tailored to their needs. Some of the applications we received have talked about a long-standing desire to be part of a church. Our hope is that their scholarships will allow these young people to break down the barriers to attendance and deepen their life of faith. Susan: In my diocesan position, I have been working with a vestry of a small Episcopal church in a midsize town to put some of these principles into action. They went out into their community and interviewed a number of the community leaders about the issues facing the town and how their church could help. One leader was the manager of a Boys and Girls Club across the street from the church. The manager suggested that the church could play a role in helping the children develop faith and character. The church is now taking 25-30 children one afternoon a week for a couple of hours, giving them snacks, mentoring, tutoring, fun, and a time of learning about the Bible.